Experts at Briggs & Stratton offer tips on how pressure washer accessories, detergents and attachments can save time spent cleaning outdoor spaces. 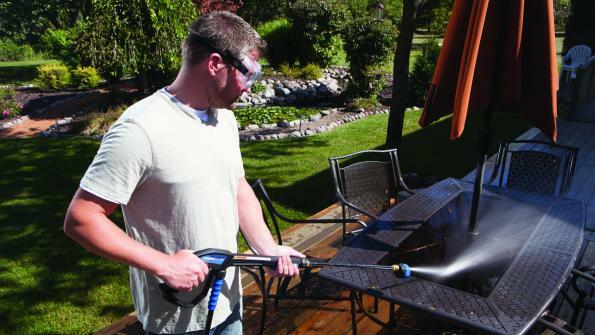 Editor’s note: Adding a few accessories to a pressure washer can speed outdoor cleaning. Experts at Briggs & Stratton offer tips on how pressure washer accessories, detergents and attachments can save time spent cleaning outdoor spaces. 1. Use the best attachment for the job: Save wear and tear on equipment as well as time, water and effort by using the right pressure washer attachment for each cleaning job. Be specific about what you need to accomplish (cleaning a glass patio table requires different equipment than blasting a second story window). 2. Match the right detergent to the task: A variety of pressure washer detergents are available for many different applications. A multi-purpose cleaner is suited for heavily soiled areas around the outside of buildings while a heavy-duty degreaser removes gas, oil and grease stains from garage floors and parking areas. Wood surface cleaners are made specifically for use on wood decks, fences and siding while a vehicle wash detergent helps break down dirt, grime and grease from cars, trucks and boats. 3. Let detergent soak: If using pressure washer detergent to clean difficult stains, be sure to let it soak for 3-5 minutes before rinsing. Detergent, through its composition, needs time to attach to a stain and lift it from the surface being cleaned. 4. Use a rotating surface cleaner: Avoid uneven “zebra stripes” left by your pressure washer on garage floors, parking areas, patios, sidewalks, decks and virtually any large, flat area, by using a surface cleaner attachment. 5. Extend reach: Increase the reach of your pressure washer without needing a ladder by adding extension wands. Propel water to gutters, soffits, second story windows and other hard-to-reach areas by securely threading together a three-piece extension wand for an additional nine feet of range. It is also easy to extend existing pressure washer hoses or replace worn or damaged hoses with new 25-, 30- and 50-foot versions. 6. Change spray patterns with a multi-tip nozzle: Make changing spray patterns a snap with one convenient, multi-tip hose nozzle head and eliminate the potential of lost or damaged individual spray tips. Just push, turn and click the nozzle head (similar to a garden hose nozzle) to change spray patterns from pinpoint to wide fan for precise cleaning, as well as use detergent and flush options. Milwaukee-based Briggs & Stratton is a producer of gasoline engines for outdoor power equipment. The firm’s subsidiaries include marketers of portable generators, pressure washers and turf care products. The video shows how Briggs & Stratton Powerflow+ pressure washers deliver high pressure for cleaning deep grit and grime.